Now that peach season is upon us I’m sharing my easy to make but intensely flavored peach compote which is nothing more than peaches marinated in honey, orange zest and almond extract. Spoon this over shortcake as an alternative to strawberries and and see if you don’t like it just as much. 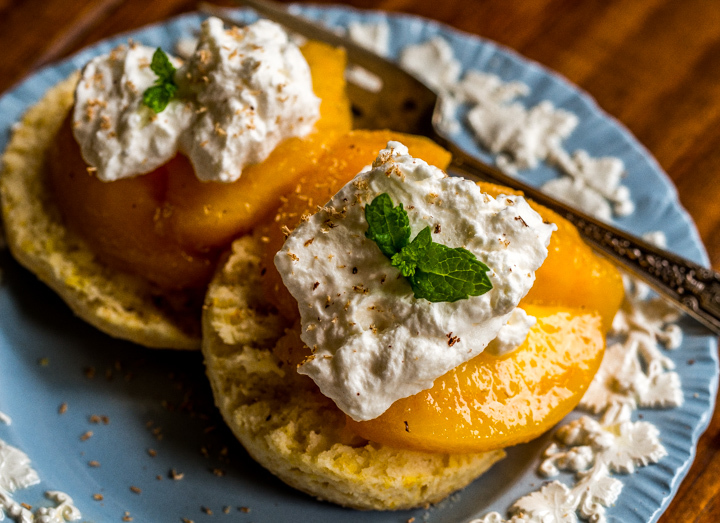 Peach compote is also great over ice cream, angel food cake, vanilla soufflé, or your breakfast granola you name it, but for this I wanted to do a traditional shortcake prep so I started checking out recipes and confirmed something I’d always suspected. If you input “shortcake” into the Ancestor.com search engine you come up with a family tree that includes English scones and southern style biscuits. In fact, all three are as closely related as the inhabitants of an Arkansas trailer park. 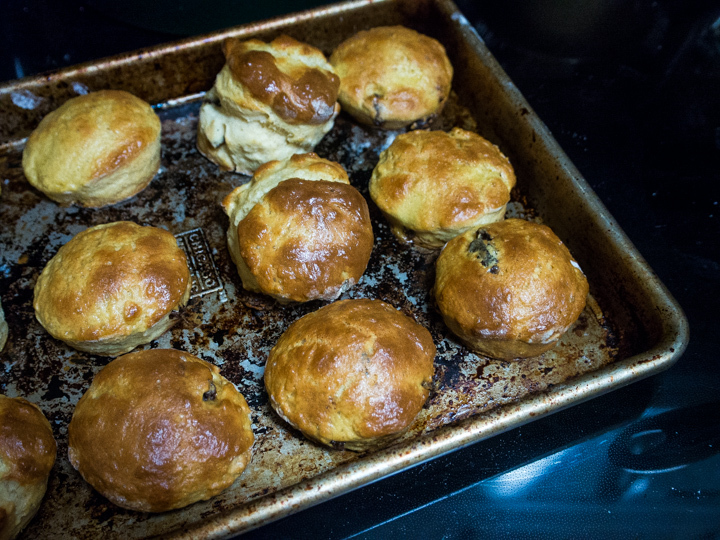 Apparently, the line of succession starts with the scone which evolved into the biscuit which soon thereafter morphed into “shortcake.” Scones and shortcake are eaten with sweet toppings, usually made with cream and are cakier, while biscuits are flakier and are generally eaten with savory sides and made with buttermilk. So it’s pointless to go on a time consuming hunt for the perfect recipe as they’re all essentially the same. Many American recipes for scones and shortcake call for sugar. I don’t because all the toppings have sugar whether it’s compote, jam or whipped cream. If you must have sugar add a couple of tablespoons to the dry ingredients but it’s not necessary. That means that the search can stop here. This recipe is standard and easy with a few optional tweaks that make it especially delicious for this topping. Start by putting the dry ingredients in a mixing bowl and grating in some orange zest and nutmeg to taste. Use your hands to cut in the butter. You can do this in a food processor but it takes about the same amount of time. Your choice. Just make sure that the resulting mixture has a pebbly texture. Next pour in the cream and egg mixture (saving about 2 tablespoons of it for glazing the shortcake) and stir until you have a dough that adheres. 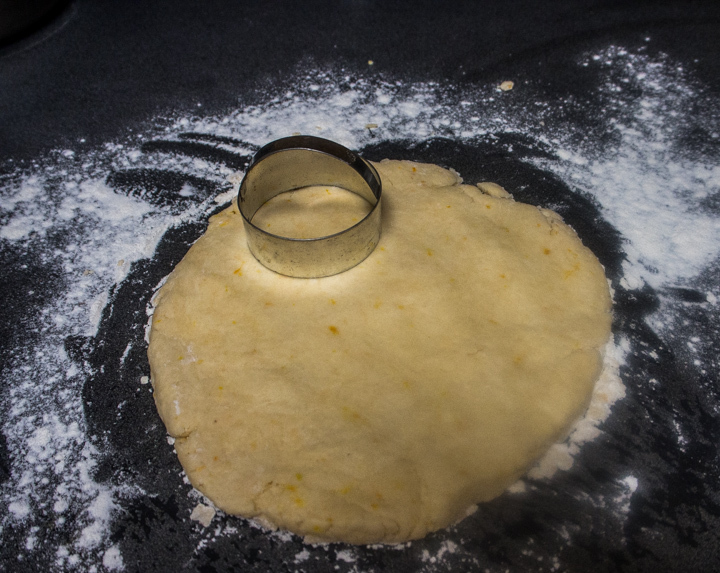 Put the dough onto a floured surface and pat or roll it out to a thickness of about an inch and a half. Cut into rounds, place on a cookie sheet and glaze with the remaining egg wash. As you can see, there are raisins in one of the test batches below. 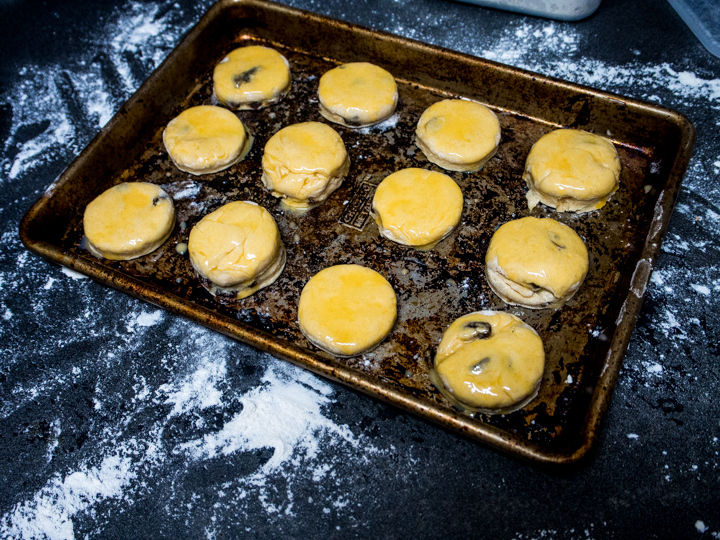 Raisins are great if you’re serving shortcake or scones with butter & preserves but for this prep they aren’t really necessary. You’ll also notice that some of the shortcakes are thinner than others. When I was spooning the peach compote over the split shortcake I found that I preferred a thinner drier cake. Seems to stand up to the liquid better, but as always, go with your preferences. After everything is done it remains only to split the cake, anoint it with peaches and cream and enjoy until peach season ends. Mix honey, orange zest, & almond extract in the bottom of a bowl. Peel & slice the peaches. Try to do this right over the bowl so it will catch the juice. If you're having a hard time peeling the peaches submerge them in boiling water for a minute then remove. The peel should come off easily. 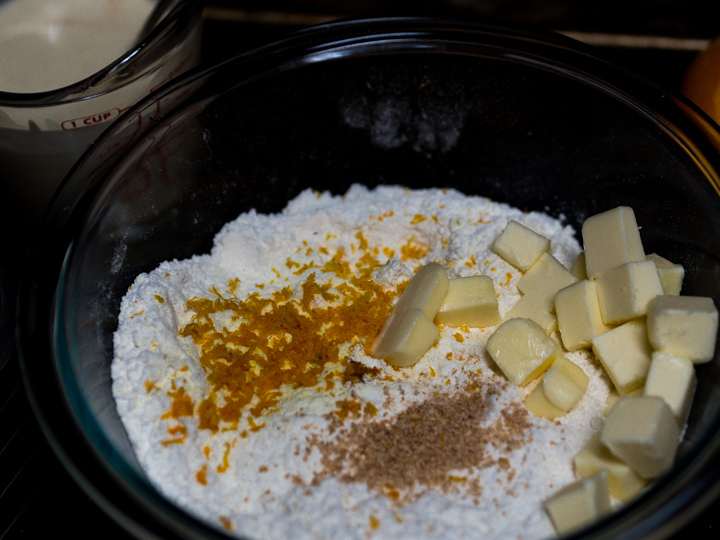 Mix the dry ingredients in a bowl along with the orange zest & nutmeg. Cut into chunks cool but not cold butter. Work this into the flour till you have large pea sized chunks. Whisk together the cream egg and vanilla. Slowly add the cream mixture to the dry ingredients till you have a shaggy dough. Dump onto a floured board and pat into a circle then cut into rounds. If you want the tops to be golden save a little of the egg/cream mixture and brush over the tops. When the shortcakes have cooled split them, spoon compote over and top with whipped cream & mint. I just met you at the bookstore yesterday. I will make this yummy looking dessert when I get back from my trip. Lois – wonderful to hear from you. I know you’ll get to eat lots of delicious things in Brazil and hope you’ll enjoy making the peach shortcake when you return. Let me know how it comes out.